Take another look at the picture - everything's included! Suitable for ages 3+, this great backpack is just the right size for nursery or infants school. The high quality backpack measures approx 30cm x 27cm and the presentation box measures 50cm x 35cm. The box is a little flimsy, so this set might not be suitable as a grand gift, but if it's the backpack and the other contents you're after, get it now before they're gone! 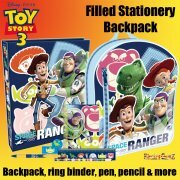 Also included are a pen, eraser, sharpener, pencil case, scribble pad, ring bound sketch book, pencil and ruler - all Toy Story themed. 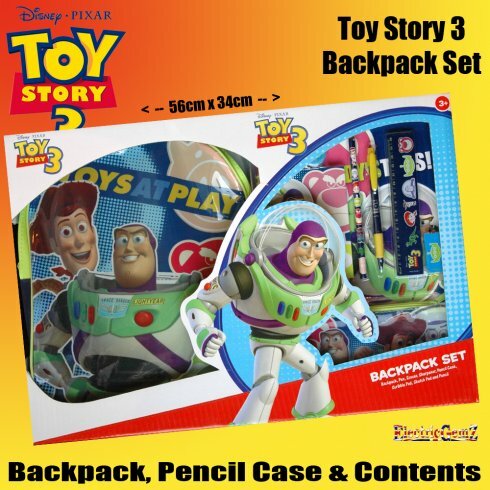 There are lots of great Toy Story gift ideas in our Online Shop.